There has never been a wider choice in paving materials on the market than what we have right now. Asphalt is the most popular of these for roads and sidewalks. The National Asphalt Pavement Association estimates that as much as 350 million tons of asphalt is laid every year . However, permeable versions of both concrete and asphalt are becoming increasingly popular. This is mostly because they maintain the rigidity of the traditional material while allowing for water to infiltrate and recharge aquifers. When considering which material to use for your next project, it is not as simple as choosing the most popular material though. To make the most informed choice that will give your client the best value over the lifetime of the pavement, you need to carefully consider installation costs, life cycle costs and the intended use of the surface. Project managers and developers who fail to consider all of these factors risk choosing the wrong surface. This can result in budget blowouts, or the high cost of replacement or repair of damaged surfaces. The most obvious (but not the only) cost of a paved surface is the initial installation cost. Below, the major factors to consider when calculating the installation cost will be outlined. Preparing the ground for laying pavement is a key factor in ensuring the longevity of the paved surface. This refers to the work done to stabilize and level the subgrade and granular base course. With hard, inflexible surfaces such as asphalt and concrete, ensuring the subgrade is stable and at the required elevation is a crucial task and can be a lengthy and costly process . This cost increases even further when permeable concretes and asphalts are used, which require more substantial sub bases and water distribution systems. Brick or stone pavers also require a well levelled base, or there is a risk of uneven surfaces which creates a health and safety risk . In terms of surface preparation, natural and stabilized aggregates are much more forgiving. Because the aggregate itself is laid loose and then compacted, inconsistencies in the height or level of the subgrade can be corrected with minimal effort . Bear in mind that these are very rough estimates and do not account for project specific needs. Depending on the requirements of the project and the thickness of pavement needed, these costs can increase substantially. The big variance in concrete and asphalt costs can be attributed to the price differential between traditional and permeable varieties. The need for decorative patterns and designs can inflate material costs, as shown by the big variation shown in the cost per square foot of Concrete interlocking pavers. The actual cost of manpower and machinery needed to install the pavement also needs to be considered. Asphalt and natural aggregates are both relatively quick to install, with the aggregate being the overall easiest. Both require some effort to spread and compact, but can be used almost immediately . 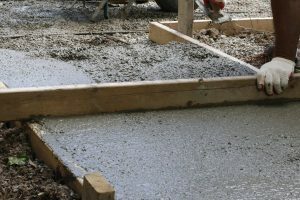 Concrete is much more difficult to lay and getting a flat and useable concrete requires a level of finesse and skill not needed for asphalt or aggregate . It also takes some time for concrete to set and during this time it is susceptible to damage. Permeable concrete and asphalt are installed in almost the same way, but often result in an unattractive surface that is not natural and also does not quite have the clean lines of traditional hard surfaces. Concrete interlocking pavers are by far the most complex and time consuming to lay. Adjusting for a segmental system over large areas requires a lot of focus on base and subbase elevation heights. The individual unit system allows for planned elevation changes to provide engineered slope changes, however there is no forgiveness in the thickness of the pavers, so getting the finished surface height correct starts at the bottom. The paving material must be laid in individual pieces and often complex patterns are used that take time and expertise to get right. The last thing to consider when looking at installation cost is the need for drainage when installing hard surfaces. Local and state governments across the country are becoming increasingly prescriptive about the amount and type of drainage required when paving new areas . You need to include the cost of this in your overall appraisal of the project. Impermeable paving materials such as asphalt, concrete and bricks generally require much more elaborate drainage systems, while natural aggregates are able to rely on natural infiltration . Surprisingly, permeable concrete and asphalt also require a lot of attention when it comes to water flow management due to the increase infiltration rates they allow. Water cannot be allowed to accumulate in any large amount under these rigid surfaces, so complex drainage systems may be necessary. Many projects have run way over budget in the long term due to inaccurate life cycle cost calculations. All paved surfaces, even the ones that seem tough and immovable, have ongoing costs and will need to be replaced eventually. When conducting a Life Cycle Cost Analysis (LCCA) for a new paved area, the following need to considered carefully. The obvious way to spot an ageing paved surface is the presence of cracks and holes. Both asphalt and concrete are particularly susceptible to this due to their rigidity . Concrete interlocking pavers are also very susceptible to movements in the substrate . Natural aggregates and Natural aggregate binders are clear winners on this front, as they can have damage fixed easily with basic hand tools and minimal extra material . Aggregate binders, such as Organic-Lock™, reduce lifetime maintenance costs based on the added stability of the binder that prevents the aggregate from being washed out. Maintenance, especially on pedestrian areas, needs to be regular and comprehensive. Any damage to the paved surface can be a health and safety hazard and pose an obstacle to disabled access. Small problems can often become big problems when they are ignored. 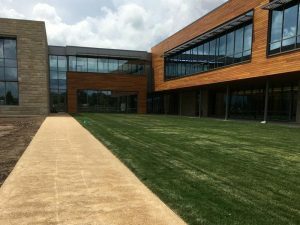 Cleaning is a key consideration when it comes to paved surfaces, but often is an afterthought in project planning. All hard surfaces, and especially porous asphalts and concretes require regular cleaning to maintain the usability of the surface and ensure it lives out its full lifespan . Permeable concrete and asphalt surfaces that are not cleaned will become clogged, blocking infiltration and natural aquifer recharge. Once this happens the only option is costly replacement. As this case study of a university car park shows, the difference in cleaning costs between paving materials can change the life cycle cost of the project by thousands of dollars . Once again, natural aggregates beat the competitors in this field, requiring the least cleaning over their life cycle. The time until replacement is possibly the biggest factor in calculating lifetime cost. Most materials have a general lifespan, which varies based on climate and how heavily used it is. In general, hard surfaces such as concrete and asphalt can last up to 25 years when well maintained, which in some way makes up for the high initial cost to lay them . However, when properly maintained aggregates will never need to be entirely replaced, which minimizes disruption and helps keep the lifetime cost of this paving method low . This longevity is further enhanced when a stabilizer, such as Organic-Lock™ is used to prevent erosion and washouts in aggregate paths. As you can appreciate, keeping installation life cycle costs in mind make choosing the right pavement material difficult. If in any doubt about the paving choice for your next project, the best thing you can do is contact a professional who specializes in this field. With their experience and guidance, you will be able to make a more informed decision provides the best and most cost effective paved surface over the long term. Babashamsi, P., Yusoff, N.I., Ceylan, H., Ghani, N., Jenatabadi, H.S. (2016). Evaluation of pavement life cycle cost analysis: Review and analysis. International Journal of Pavement Research and Technology, 9(4), pp. 241-254/ DOI: https://doi.org/10.1016/j.ijprt.2016.08.004.